Design and make a silver ring: Weekend jewellery course. – On this weekend jewellery course you will design and make a silver ring to your very own design. You will experiment with hammering techniques, learn how to size a ring, and practice cutting intricate patterns. You will explore a range of approaches to texturing, shaping and forming metal, completing several experimental rings in copper and aluminium. Then you will work in sterling silver to produce your final design. 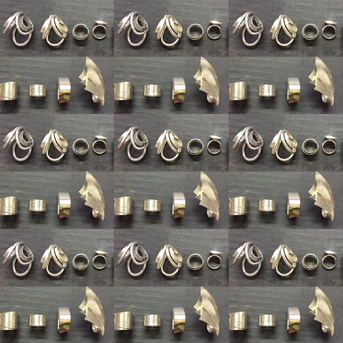 Generally over a weekend, students produce at least 1 silver ring, also producing a range of developmental pieces in copper, aluminium or silver, that can be made into rings, earrings or pendants. The course fee covers the cost of non-precious materials, and you will also be provided with silver to make your ring.